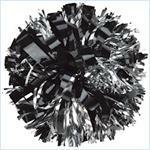 Cheer Balls are an inexpensive alternative to real poms - they are poms without handles. These Cheer Balls come flat, not fluffed up, held together in the center with a strong wire clip. They fluff up just like real poms. Cheerleaders hold on to the strands themselves. They are great for practice poms or for youth groups who want to save money but still have some sort of poms for the girls. By being packed flat, you also save on shipping! These are custom made for your group. Minimum order is 12 cheer balls (6 pairs). Allow about 7 days for production. These ship from California. 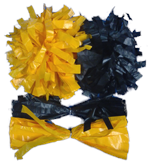 Custom Made Pom Balls, no handle poms made of a mix of plastic & metallic strands, in your choice of widths & lengths. Ships in about 2 weeks from west coast, minimum order 10 pom balls.